Photography allows us to relive some the most valuable moments and memories of our lives. From a formal wedding day photo to a snapshot of your family during your last summer vacation, there are so many remembrances that we hold onto year after year. Unfortunately, many of these photos remain stored on our hard drives, computers and mobile devices. Why not enjoy these pictures every single day and keep your most cherished memories close. 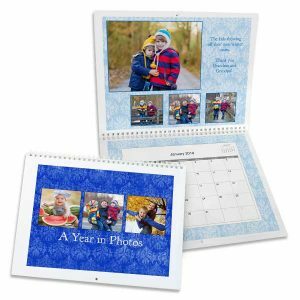 With our Custom Photo Calendars you can keep track of the upcoming days and months this year while admiring life’s most precious moments. Not only will you stay apprised of important dates, engagements and appointments, but you can choose between several calendar styles and artistically display your photos. Select from several different photo layouts and even add your own text to fully personalize your calendar. Our classic spiral bound wall calendars and single page poster calendars are available in different sizes and background patterns. Choose pictures from your digital collection to match the theme of each season or pick a layout to showcase your favorite family snapshots. 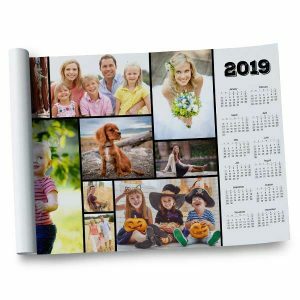 Not only is a customized photo calendar perfect for keeping your schedule on track but also makes a wonderful birthday or holiday gift for your friends and family. Depending on the size and orientation you choose, there are several options for displaying your photos on a custom calendar. Both our single page and spiral bound photo calendars have various available photo layouts. For a picture that makes a statement, we offer a single photo layout that will proudly display any image in a large format. Maybe you have a series of photos that you have thought about showcasing together. Choose from one of our multi-photo layouts and create an artistic photo collage to show off through the months of the upcoming year. With dozens of layouts, patterns and colors, you can easily compliment the photos you have chosen to display each month. Your new photo wall calendar will be a practical piece of wall art, allowing you to admire your pictures while planning your schedule year round. First, gather your favorite photos that you want to display on your personalized calendar. Upload your photos directly from your computer or even choose pictures from your Facebook and Instagram accounts. 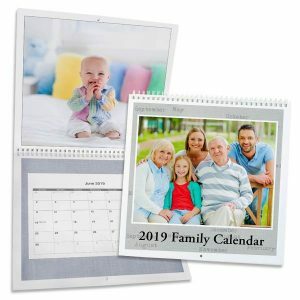 Then, select from the four different calendar styles that we offer which include the 12×18 Calendar Poster, the 8.5×11 and 12×12 Photo Wall Calendars and the 8×10 Photo Paper Calendar. Afterwards, choose from our variety of backgrounds and create the perfect layout to showcase your photos. With our 8.5×11 and 12×12 Spiral Bound Calendars, you can even add your own text with the choice of multiple colors and fonts. Finally, review your calendar in the project builder and place your order! With so many options available, you can easily create a high quality calendar that shows off your best photos and fits your style to a “T”. Build one for yourself to keep up with your schedule or make one as a unique gift for someone special anytime of the year. Maybe you are looking for a simple single page calendar to display by your desk at work or perhaps you need a yearly calendar to quickly view the upcoming months in your home office. Our 12×18 Poster Calendars are easy to display anywhere around the home or office. Choose from either our portrait or landscape orientations and select your photos from your computer, Facebook or Instagram accounts. With a push-pin or thumb-tack you can easily hang them on your wall or the back of any door and plan your schedule in style. Printed on matte photographic paper, each calendar is of a durable quality so that you can enjoy it all year long. Our 12×18 Calendar Posters are perfect for quickly glancing at the months ahead and confirming the day of the week for each date. Keep your poster calendar by your desk at work or by the phone in your kitchen and easily plan your upcoming events and appointments. Are you looking for a fun gift for your son or daughter? Create the perfect back-to-school calendar using your kids’ favorite photos. They are perfect for hanging in their locker at school and they can keep up with their schedule with style. With a poster photo calendar you can liven up your workspace and add a little color to your daily routine while enjoying your favorite memories year round. Are you looking for a traditional wall calendar that also displays your best photos? Choose our 8.5×11 Spiral Bound Photo Calendar and enjoy a treasured memory while reviewing your upcoming schedule and appointments. You can even use our text feature to add details for different dates throughout the year including birthdays and anniversaries. 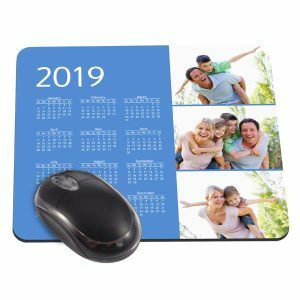 Our spiral bound wall calendars are printed on the best quality 100lb matte paper and allow you to start your calendar from the current month or create one for the following year. With dozens of photo and text layouts and several background colors and patterns, you can customize your calendar to fit in with your décor and display your most cherished photos. Hang them on the wall in your kitchen or by your desk at the office. No matter what time of year it is our 8.5×11 Calendar will make the perfect gift for anyone on your shopping list. For a truly customized schedule planning experience, our 12×12 Spiral Bound Wall Calendar will certainly fit the bill. Choose a stylish background to accentuate your photos and even enter your own text for each day of the year. Our text feature is perfect for keeping track of birthdays and other important events throughout the year. Our bevy of photo layouts will allow you to artistically exhibit your favorite photos for each month. Do you have a collection of beloved Instagram photos? The square format our 12×12 Photo Calendar is perfect for your Instagram masterpieces and will brighten up each day of the upcoming months. When building your calendar, you can start from either the current month or create your calendar for next year. Keep all of your appointments and events straight while enjoying your favorite photos day after day. Our 8×10 Single Page Photo Calendars can be hung virtually anywhere or kept on your person for convenient schedule planning. Measuring 8×10, they are printed high-quality photographic paper and are available in either a portrait or landscape orientation. Hang them by your desk or on the side of your refrigerator for a quick view of the upcoming year. They also make the perfect addition to your schedule book or binder so that you can easily view your schedule on the go. Print a collection of your favorite pictures or feature a single photo to view along with the months and days of the current year. With their many options and compact size, our 8×10 Single Page Calendars are great for keeping up with your schedule anytime, anywhere. Do you want a more exciting way to keep up with your schedule? Maybe you are just looking for a unique and practical way to display your cherished photos. 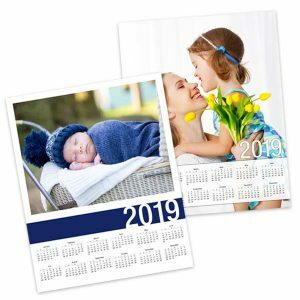 Our customized photo calendars are not only a great way to admire your favorite digital images but will assist you in keeping track of important dates and events throughout the year. Showcase a group of family snapshots, landscape photos or photographic portraits each and every month. Choose from several different background patterns, colors and photo layouts for a fully customized look or even add your own custom text to make note of upcoming special occasions, events and anniversaries. Just right for any room of the home or around the office, they will make the perfect gift for your family, friends, boss and coworkers.